The Scottish Professional Football League's play-offs begin on Tuesday as the battle to win promotion and fight to avoid relegation continues. 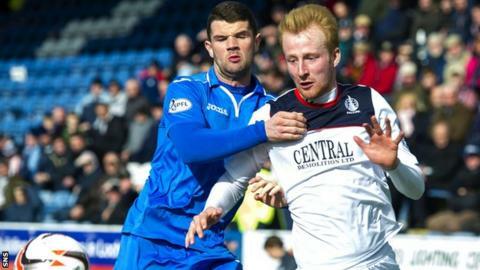 Queen of the South host Falkirk in the first leg of the Premiership play-off quarter-final. Then, on Wednesday, the Championship and League One semi-finals begin. Cowdenbeath visit Ayr United and Stranraer host Dunfermline, while Clyde take on East Fife and Stirling Albion entertain Annan Athletic. The return legs of all these ties will be staged on Saturday afternoon, with the subsequent rounds beginning on 13 and 14 May. Automatic promotion has already been secured for Dundee to the Premiership, Rangers to the Championship and Peterhead to League One. Hearts have been relegated to the Championship, Greenock Morton have been demoted to League One while Arbroath will drop into League Two. The format for the Championship play-off pitches the second bottom side in that division against the team finishing fourth in the league below, with the second and third placed sides in the lower division also playing off at the semi-final stage. The same format occurs between the corresponding League One and Two sides in the League One play-off semi-finals. However, the Premiership series differs. After Falkirk or Queens (who finished third and fourth respectively in the Championship) progress, they will face that division's runners-up Hamilton Academical over two legs. The winner of that semi-final will go on to play the side which finishes second bottom of the top flight - a position still to be decided. Current occupants Kilmarnock as well as Ross County, Partick Thistle and Hibernian are all still in a tussle to avoid the Premiership play-off spot.